Deciding on a pit bull harness isn’t easy. 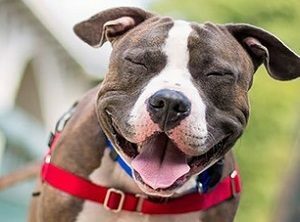 There are a number of factors to consider before purchasing one for your pit bull. 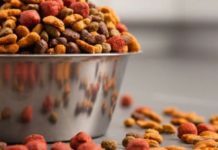 These include the price of the model, if it’s going to be comfortable for your dog and whether it can be adjusted to fit the size of your pit bull. Some of the other features that may need to be considered are whether the model is reflective, how it buckles and whether it has a D-ring attachment for hooking up a leash. 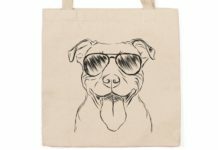 Of course, you’ll also want to find one that fits the style of your dog. 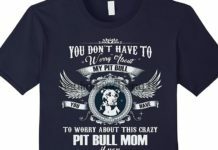 While that isn’t the most important factor, it can be the deciding one when you are choosing between a certain harness for pit bull dogs and another one that has the same features. Since you’ll be buying a model that you’ll be using for quite some time, it’s important to think about what’s currently available. Below are some of the models currently available. Designed to accommodate larger dogs, the Babyltrl No-Pull Harness is designed to accommodate the chest of pits which fall between the 22-inch and 35-inch range. This model is specially designed to distribute pressure across the body so that even if your pit tries to pull ahead the harness won’t pull or choke him or her. 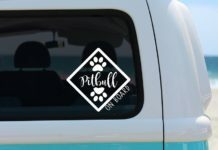 Another great feature of this unit is that it’s made from a lightweight and reflective material that ensures that your pit-bull is seen, even in lower light conditions. Other features that can be found in this design include quick-snap buckles that lock for added security during walks or runs and a sturdy handle that gives the handler extra control over the dog when it’s needed the most. 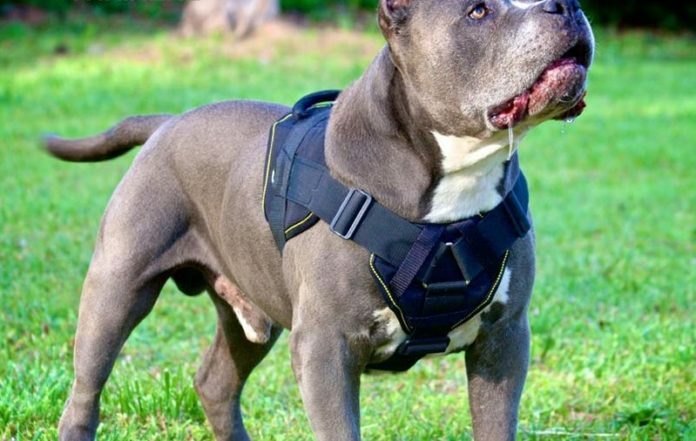 The Lifpul Vest Harness is designed to keep your pit-bull under complete control at all times, yet give the dog the freedom to move that it needs. This high-quality vest is easy to put on and take off the dog and is designed with a D-ring connector that can not only be tied to a leash for walks and runs but can also be attached to a seat belt to keep your dog safe while going on road trips. Made with a breathable fabric that gives your pit bull a nice range of motion and a spongy collar, this harness is made to be loved by the pet as much as the owner. Available in a variety of colors and a variety of different sizes, the Juxzh Soft No-Pull Dog Harness can fit dog chest sizes of up to 42-inches. This reflective and stylish harness has two distinct attachment points for leaches – a round ring on the dog’s chest and a V-ring on the back, and also has a handle where a seat belt can be attached for taking your pit-bull on trips. Another feature of this low-profile harness is its easy-to-use buckle system which allows the dog to be easily harnessed and unharnessed without a whole lot of hassle. This harness is great for daily use or for training your pit-bull. Designed exclusively to be used by large and extra-large dogs, depending on size purchased, the Pet Lover’s Stuff Large Breed Dog Harness comes has a number of features which make it useful for pit-bulls. The large size can fit dog’s chest sizes up to 33-inches and the XL-size can accommodate dogs with a chest size up to 36-inches. This padded model also has reflective trim for safety and is fully padded for your dog’s comfort. 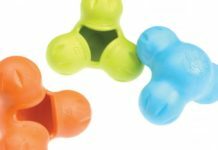 Other features of this model include neck and torso straps which allow it to be customized to your pet’s size and a design that allows it to be put on and removed quite easily. This pet harness comes equipped with spikes and studs so your dog can walk with a heavy-metal swagger. This harness, paired with a leash and a spiked leather collar, is flexible and not only gives your pet a rock and roll look but is also fairly comfortable as well. It’s well-designed and durable enough to be used for day-to-day use or it can be used for costume parties and special occasions. 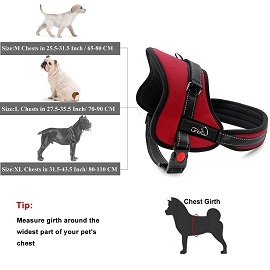 The XL-harness will fit dogs with a chest of between 26-inches and 34-inches. This is definitely a site for pet owners who want to make sure their dog shows some attitude.